80 Commonwealth is located on the south side of Commonwealth, between Berkeley and Clarendon, with 78 Commonwealth to the east and 82 Commonwealth to the west. 80 Commonwealth was built ca. 1872 by Charles J. Fox, a mason and builder, one of three contiguous houses (76-78-80 Commonwealth) he built for speculative sale. All three houses were Brownstone Gothic in style, designed as a symmetrical grouping: 76 Commonwealth and 80 Commonwealth as mirror opposites with bays flanking 78 Commonwealth with a flat façade. 78 Commonwealth was replaced in 1922-1923, the fenestration on the second and third stories of 80 Commonwealth was altered sometime prior to the early 1940s, and the original mansard and Gothic dormers of 76 Commonwealth were replaced in the early 1970s. Click here for an index to the deeds for 80 Commonwealth. On November 19, 1874, 80 Commonwealth was purchased from Charles Fox by merchant James Bowen. He and his wife, Eliza Matilda (Alline) Bowen, made it their home. They previously had lived at 282 Tremont. They continued to live at 80 Commonwealth until his death in August of 1881. Eliza Bowen continued to live at 80 Commonwealth during the 1881-1882 winter season, but moved thereafter. 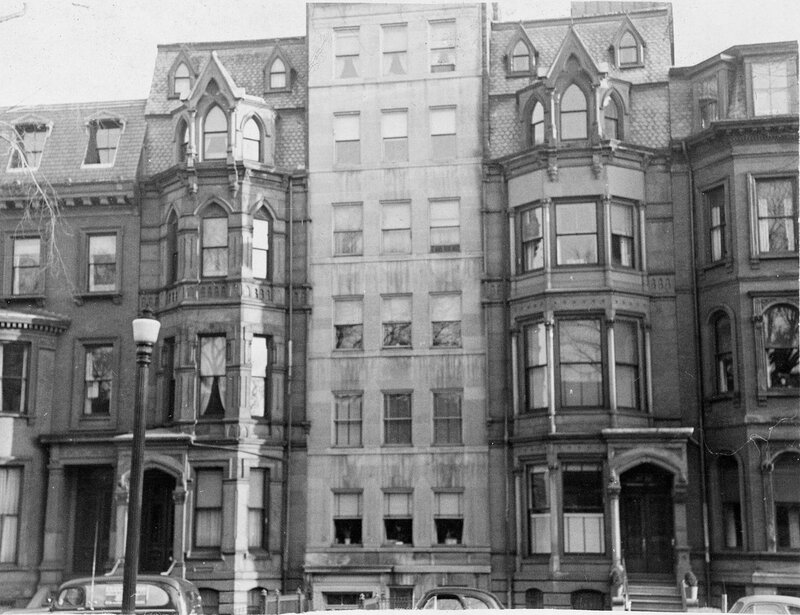 By the 1884-1885 season, she was living at the Hotel Brunswick (southeast corner of Clarendon and Boylston). During the 1882-1883 winter season, 80 Commonwealth was the home of retired merchant and banker John Endicott Peabody and his wife, Gertrude (Lawrence) Peabody. They previously had lived at 91 Marlborough. By the 1883-1884 season, they had moved to a new home at 183 Marlborough. By the 1883-1884 winter season, 80 Commonwealth was the home of lawyer William Frederic Duff and his wife, Virginia Bell (Shepley) Duff. They previously had lived at 3 Park. They continued to live at 80 Commonwealth during the 1885-1886 season, but moved thereafter to the Hotel Vendôme. 80 Commonwealth was not listed in the 1887 Blue Book. On May 28, 1887, 80 Commonwealth was acquired from Eliza Bowen and her surviving children (Eliza M. Bowen, John Templeton Bowen, and James Williams Bowen) by Oliver M. Wentworth, a marble and granite manufacturer. 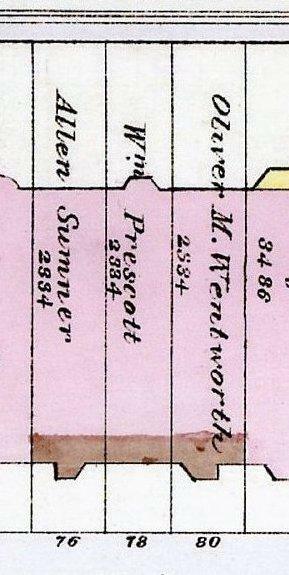 He and his wife, Melvina (Gill) Wentworth, lived at 182 Commonwealth. On September 19, 1887, 80 Commonwealth was acquired from Oliver Wentworth by William Edward Lovell Dillaway and his wife, Gertrude (Eaton) Dillaway. They previously had lived at 553 Columbus. William Dillaway was a lawyer, investor, and businessman. He was president of the Boston Pneumatic Transit Company, which received a contract in 1902 from the US Post Office to carry the mail by pneumatic tube, and subsequently built a system connecting the Boston post office with North Station and another system for carrying packages in the Back Bay, South End, and other parts of Boston. Gertrude Dillaway died in April of 1904. They had no children. 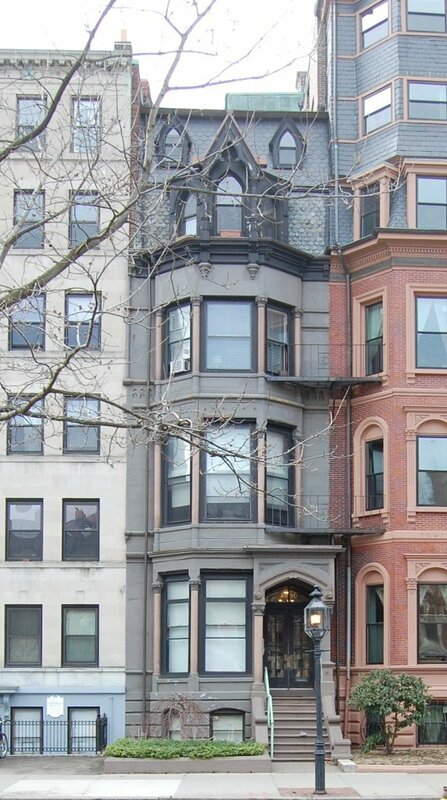 By 1910, and possibly before, Katharine A. Laughlin had become housekeeper at 80 Commonwealth for William Dillaway. She continued in that role until his death in June of 1927. On May 26, 1927, one week before his death, he recorded a deed transferring 80 Commonwealth to her, with the deed dated April 18, 1912. On February 4, 1928, 80 Commonwealth was purchased from Katharine Laughlin by Mary E. (Roberts) Best, the wife of Edward Henry Best. They previously had lived at 6 Chamblet. They also owned a farm in Mont Vernon, New Hampshire. Edward Best was a manufacturer of industrial felts and similar materials. In April of 1929, Edward Best applied for (and subsequently received) permission to install an elevator and add a penthouse with copper-clad walls. The remodeling was designed by architects Bigelow, Wadsworth, Hubbard, and Smith. It may have been at this time that the fenestration on the second and third stories was altered. Edward Best died in January of 1935. Mary Best continued to live at 80 Commonwealth until about 1938, but had moved to an apartment at 50 Commonwealth by 1939. On October 11, 1938, 80 Commonwealth was purchased from Mary Best by Dr. Mark (Mendel) Manuel Burke, a dentist, who made it his home and medical office. He previously had lived at 1111 Boylston and had maintained his office at 64 Commonwealth. He was unmarried. Although the legal occupancy of 80 Commonwealth remained as a single-family dwelling, Mark Burke converted it into two residential units and several medical offices. He lived in one of the units and rented the other to various tenants. By 1940, Mark Burke had been joined by his brother, Louis Elliott Burke, a buyer for a wholesale liquor company. Another brother, Samuel J. Burke, also a dentist, maintained his office with Mark Burke at 80 Commonwealth. He and his wife, Jeanne (Landay) Burke, lived in Roxbury. Louis Burke married in 1944 to Frieda Rosenthal. They continued to live at 80 Commonwealth until about 1951, when they moved to Swampscott. Samuel Burke continued to maintain his office at 80 Commonwealth until his death in May of 1956. From about 1944, Dr. Israel Michael Blumerfield also maintained his office at 80 Commonwealth. He was a physician and dermatologist, and served as the physician for the West End House, of which he was a charter member. He and his wife, Celia (Fowler) Blumerfield, lived in Brighton and later in Newton. He continued to maintain his office at 80 Commonwealth until his death in September of 1971. Mark Burke lived and maintained his office at 80 Commonwealth until his death in April of 1951. By the mid-1950s, it appears to have increased the number of residential units, making it a three-family residence with two medical offices on the first floor. On May 12, 1962, 80 Commonwealth was acquired from Mark Burke’s estate by Bessie Jacobs, trustee of the A & B Realty Trust. In June of 1962, A & B Realty applied for (and subsequently received) permission to convert the upper floors into six apartments (two each on the second and third floor, and one each on the fourth and fifth floors). In July of 1962, A & B Realty amended the application to add an apartment in the basement. The two medical offices remained on the first floor. By the mid-1970s, the medical offices had been converted into apartments, bringing the total number of apartments to nine (the legal occupancy remained six apartments and two medical offices). On July 21, 1978, 80 Commonwealth was acquired from Albert B. Miller, successor trustee of the A & B Realty Trust, by Barry I. Needalman and his wife, Ann-Marie Needalman. They lived in one of the apartments. In April of 1982, he applied for (and subsequently received) permission to remodel the building, combining the two apartments on the top floors into one unit. In September of 1982, he applied for (and subsequently received) permission to legalize the occupancy as eight apartments. On July 25, 1986, 80 Commonwealth was purchased from the Needalmans by Frederico, Giovanni, and Carlo Castellucci, trustees of the Victoria Trust. On August 9, 1986, they converted the property into eight condominium units, the 80 Commonwealth Condominium. Frederico, Giovanni, and Carlo Castellucci retained ownership of all eight units and on December 6, 2014, transferred them to the 80 Commonwealth Avenue LLC, of which they were the managers of record. 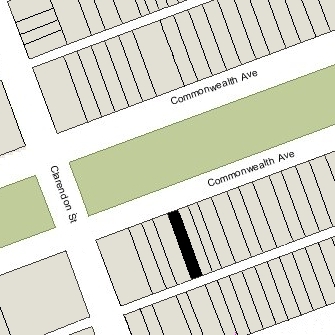 On January 19, 2016, all eight condominiums were purchased from the 80 Commonwealth Avenue LLC by the 80 Commonwealth Ave Development LLC (managed by the Pangaea Realty Corporation, George S. Dabney, president). It subsequently remodeled the building into three units. On October 5, 2018, the 80 Commonwealth Ave Development LLC converted the property into three condominium units, the 80 Commonwealth Avenue Condominium.